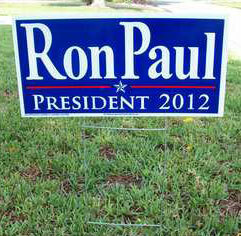 Westerville OH (FD) – It has been almost two years to the day since John Laughlin of Westerville, Ohio defensively stuck his Ron Paul for President 2012 sign in his front yard. Since that time he has waited, sometimes inside and, more frequently, outside in the bushes next to his home, for the sign to be vandalized or stolen. For two years, no one has touched the sign. Mr. Laughlin planned on having the first altercation with anti-Paulites within the first two weeks of putting the sign in his front yard. “At first I set up a web cam and some motion detectors. When I didn’t get a peep out of them, I assumed that the electronics were malfunctioning. Now I sit and wait between my two prized Juniper bushes.” Mr. Laughlin has moved the sign closer to the sidewalk and made sure the sign isn’t pushed too far into the dirt to aid any would-be-thieves in running off with the sign.